, Sieur des Avaux et de Javerci, counsellor and historiographer to the king of France, was born at Chartres in 1619. 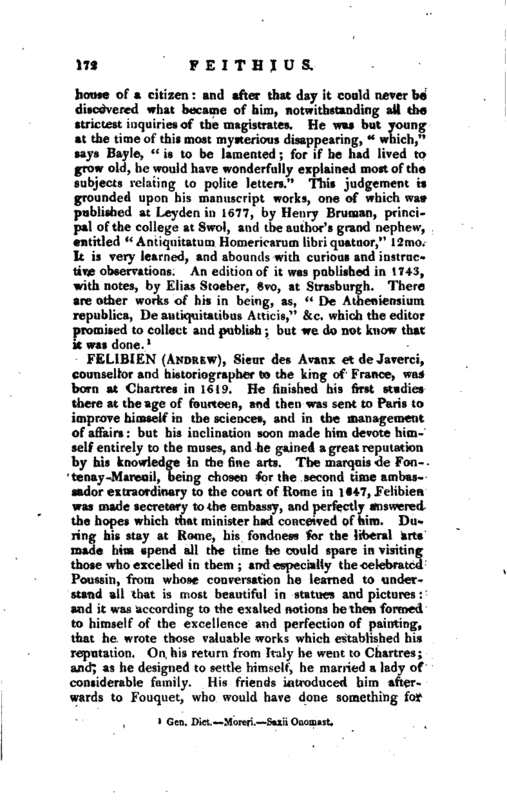 He finished his first studies there at the age of fourteen, and then was sent to Paris to improve himself in the sciences, and in the management of affairs: but his inclination soon made him devote himself entirely to the muses, and he gained a great reputation by his knowledge in the fine arts. The marquis de Fontenay-Mareuil, being chosen for the second time ambassador extraordinary to the court of Rome in 1647, Felibien was made secretary to the embassy, and perfectly answered the hopes which that minister had conceived of him. 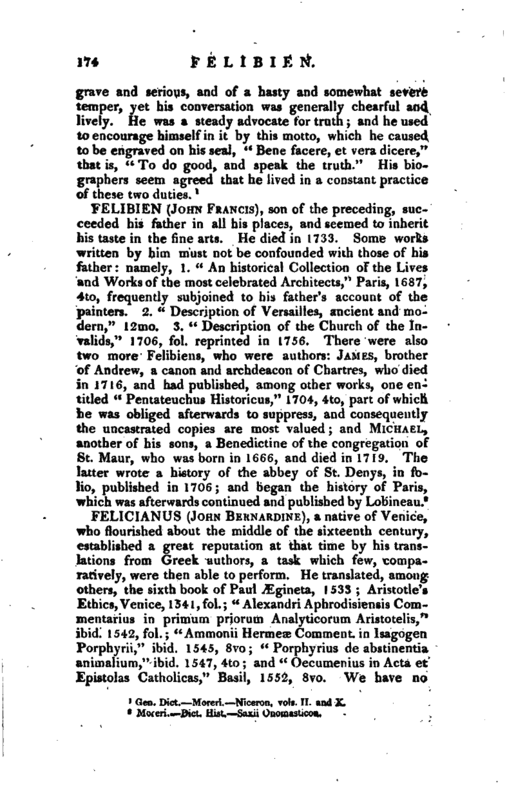 During his stay at Rome, his fondness for the liberal arts made him spend all the time he could spare in visiting those who excelled in them; and especially the celebrated Poussin, from whose conversation he learned to understand all that is most beautiful in statues and pictures: and it was according to the exalted notions he then formed to himself of the excellence and perfection of painting, that he wrote those valuable works which established his reputation. On his return from Italy he went to Chartres; and, as he designed to settle himself, he married a lady of considerable family. His friends introduced him afterwards to Fouquet, who would have done something for | him had he not soon after lost the king’s favour: but Colbert, who loved the arts and sciences, did not suffer him to be useless. 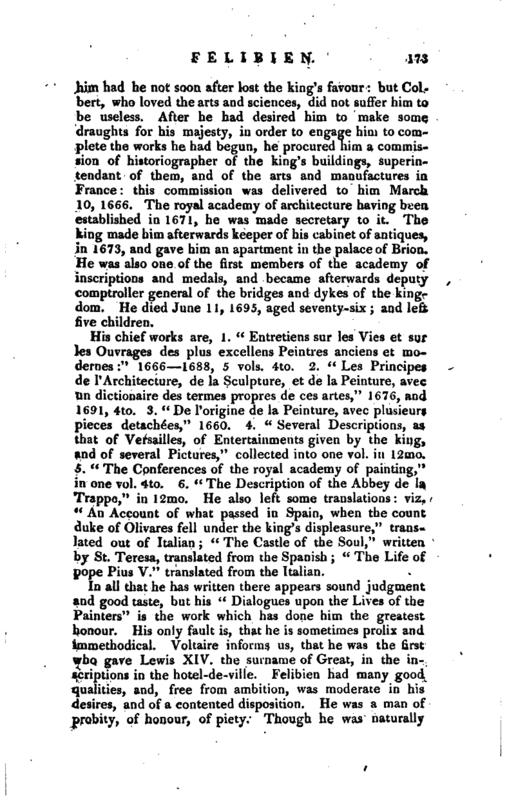 After he had desired him to make some draughts for his majesty, in order to engage him to complete the works he had begun, he procured him a commission of historiographer of the king’s buildings, superintendant of them, and of the arts and manufactures in France: this commission was delivered to him March 10, 1666. The royal academy of architecture having been established in 1671, he was made secretary to it. The king made him afterwards keeper of his cabinet of antiques, in 1673, and gave him an apartment in the palace of Brion. He was also one of the first members of the academy of inscriptions and medals, and became afterwards deputy comptroller general of the bridges and dykes of the kingdom. He died June 11, 1695, aged seventy-six; and left five children. His chief works are, 1. “Entretiens sur les Vies et sur les Ouvrages des plus excellens Peintres anciens et modernes:” 1666 1688, 5 vols. 4to. 2. “Les Principes de l’Architecture, de la Sculpture, et de la Peinture, avec un dictionaire des termes propres de ces artes,” 1676, and 1691, 4to. 3. “De l’origi.ne de la Peinture, avec plusieurs pieces detachers,” 1660. 4. “Several Descriptions, as that of Versailles, of Entertainments given by the king, and of several Pictures,” collected into one vol. in 12mo., 5 “The Conferences of the royal academy of painting,” in one vol. 4to. 6. “The Description of the Abbey de la Trappe,” in 12mo. He also left some translations: viz. *' An Account of what passed in Spain, when the count duke of Olivares fell under the king’s displeasure,“translated out of Italian” The Castle of the Soul,“written by St. Teresa, translated from the Spanish” The Life of pope Pius V." translated from the Italian. Gen. Dict. —Moreri. —Niceron. vols. II. and X.